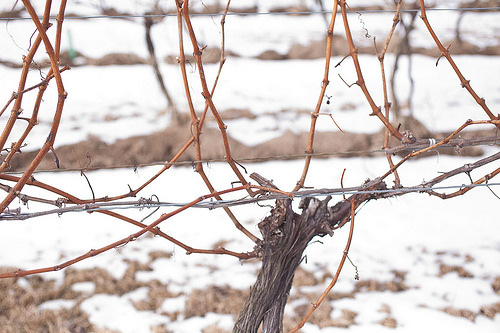 Our winter this year has been especially tough, but I hadn’t really thought about what it might be doing to the vineyards across Ontario until a winery owner mentioned it to me at Cuvée a couple weeks ago. Though most agree it’s too early to tell the true extent of the damage, all the winemakers and vineyard owners I’ve talked to have said that 2014 isn’t looking too good. 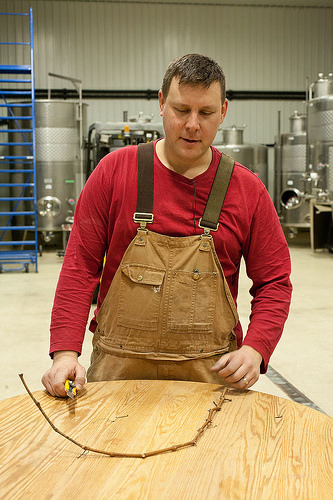 Actually, what really caught my attention was when one vineyard owner from the Lake Erie/Pelee Island region said he doesn’t think there’ll be a 2014 vintage. Period. When I heard this, I wondered how they can evaluate – at this time of year – the likelihood of damage. The answer lies – primarily – in the buds. 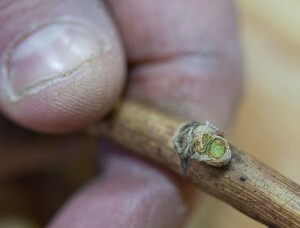 Though most grape growers wait till March or April to prune their vines, they’re keeping a very close eye on them and many are out there sampling the buds to see whether they’re dead or alive. Andrew had cut some cane samples the day before so that we’d have thawed buds to look at. The very first bud Andrew sliced (from a Merlot cane) was pretty clearly dead. The next few were also dead. He didn’t seem too surprised, since Merlot is known for being less cold tolerant than some of the other cool climate varieties. Among the buds Andrew sliced for us we did find examples of beautiful, green insides – a wonderful sign that they’re still alive. The contrast on the inside between the buds that were still alive and the dead buds was quite remarkable – and pretty obvious. Of course, the few canes we looked at aren’t a representative sample of all the vines in their vineyard or of the Niagara Lakeshore appellation, which is where Hinterbrook is located. 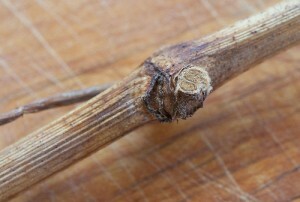 Even so, Andrew admitted that he expects the bud viability for their Merlot, for example, will be pretty low this year. He also explained that bud viability is one issue that grape growers and the industry are talking about and testing now, but it’s still too early to tell whether there has been any vine damage. They won’t know that until the leave start coming in. Though I know – intellectually – that farming is at the heart of winemaking, it’s easy to forget the risk inherent in the business of growing grapes. Andrew was also kind enough to let me shoot a video of him explaining the bud testing process. To watch the video, click here. Picked but Too Cold to Press! April showers bring … ?? Thanks, what an informative article. I’d not thought through the implications of the tough winter. Here’s hoping there are many buds with beautiful, green inside.